The independent retail sector in Northern Ireland is fighting back against a raft of difficult factors in the current trading environment in the run up to Christmas. Across the board, Chambers of Commerce, local politicians and the Northern Ireland Independent Retail Trade Association (NIIRTA) and Social Development Minister Nelson McCausland MLA are pulling together to encourage shoppers to support their local independent traders. Councillor Dermot Curran has called for Christmas shoppers to support local traders in Down District. Minister McCausland launched this year’s Shop Independent at Christmas entitled “Have an Independent Christmas” at independent furniture shop ReFound in Belfast. This campaign is about encouraging consumers to do more of their christmas shopping with independent traders and explore what our town and city centres have to offer. But whether the retail outlets are in Belfast and the main urban centres or smaller provincial towns, shoppers are being asked to shop local and look towards the independent retailers. The current recession, the increase in online shopping and the present political unrest are all taking their toll on the retail sector in Northern Ireland’s shops and it is hoped that this pre-Christmas campaign will focus minds to support local businesses. Down District Councillor Dermot Curran, SDLP local economy spokesperson, said: “We need to get our local economy off the ground. It is vital that we support this initiative. I have been personally involved in lobbying the MInister on matters to help local businesses and I certainly welcome this move. “At present our independent business sector is going through a very tough time and they need to pull through the present economic difficulties. They are the businesses who employ most of the workers in Northern Ireland. I am delighted that Finance Minister Sammy Wilson has pushed through a rates relief measure for local businesses but it has yet to come into effect. Audrey Byrne, President of Newcastle Chamber of Commerce,who has campaigned strongly for local businesses in recent years, said: “Smaller and independent shops need to had their own identity and need to be supported by the local communities. Many in our district are second and third generation businesses, and if we lost those in our town centres, eventually we would have a lot of vacant premises and gap sites which you would see in a lot of American towns. 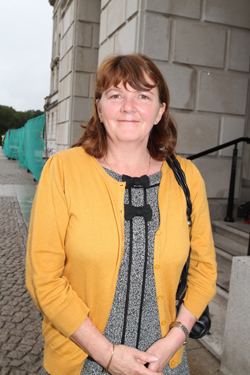 Audrey Byrne, President of the Newcastle Chamber of Commerce, pictured previously at Stormont attending a lobbying meeting with the First and Deputy First Ministers and NIIRTA and a number of other chambers from across Northern Ireland. “Northern Ireland has the highest shop vacancy rate in the UK with 1 in 5 small shops are now vacant in our town and city centres and sadly unless many local traders have a good Christmas this year, that figure is going to move to 1 in 4. ReFound is a grassroots creative business centred on bringing a fresh and stylish new approach to recycling, reinventing furniture and home interior products. Showcasing unique, upstyled products from more than 50 artists, makers and designers, ReFound is the only shop in Belfast’s ‘High Street’ that is wholly dedicated to sustainable wares. Housed in a previously empty building, a late Georgian Terrace situated at 7 Wellington Place, ReFound has found the perfect setting for their restyled products.